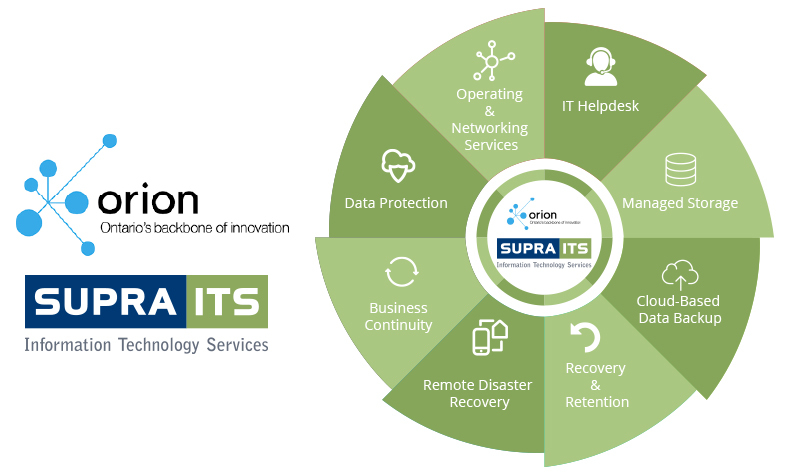 (Toronto) – Ontario Research and Innovation Optical Network (ORION) is pleased to partner with Supra ITS to provide its managed information technology and cloud services to the ORION community. The partnership gives ORION-connected research, education and innovation institutions direct access to Supra ITS’ Canadian-based, world-class, and managed cloud services. These services include compute, storage, networking and operating systems at both the infrastructure and application layers. Supra ITS’ expertise enables ORION-connected institutions to choose between in-house or managed IT functions, backed by the company’s world-class Tier 3 data centres in Ontario. Based on the robust HP Enterprise Helion Cloud System, Supra ITS’ dedicated, private cloud model is designed to reduce costs, administration and maintenance for customers, which include the option to scale public cloud services, such as Amazon Web Services (AWS) and Microsoft Azure. ORION’s connected institutions can choose among three levels of Supra ITS’ managed service desk support, ranging from basic, over-the-phone end user support for hardware and applications, to advanced operating and networking services. The Nebula is a collection of hand-picked, made-in-Canada cloud and software service providers. All Nebula partners meet ORION’s high customer satisfaction standards by providing an SLA, competitive price, as well as having its services vetted from a technical, financial and business perspective. By linking ORION’s connected institutions to a variety of strategic Nebula partners, ORION delivers a collection of unique value-added capabilities that enhances the pursuit of knowledge, social impact and economic outcomes every day. Supra ITS’ Managed Service Desk packages are tailored for the public and education sector with 24/7 IT helpdesk and are compliant with in-house and third-party service providers. Managed Storage, Backup & Disaster Recovery Services from Supra ITS include cloud-based data backup, recovery and retention, remote disaster recovery, business continuity and data protection, off-site storage and archiving. Whether an onsite or cloud solution, data from ORION’s connected institutions will always be safe and available, backed by Supra ITS’ Tier 3 data centres in the GTA, with accessible reports and audit logs via centralized administrative control. The company is a Vendor of Record (VOR) in the three categories for the Government of Ontario: I & IT Solutions Consulting Services, Management Consulting Services, and Task-based I & IT Services. The company’s VOR status recognizes its experience and expertise in many areas valued and required by public sector departments and institutions. Supra ITS is a full-service technology partner, providing customers across a variety of industries with seamless, extensive infrastructure and managed IT services that deliver value, business efficiencies and boost performance. From hardware, software and Cloud infrastructure to strategic consulting and a complete suite of Managed IT services, Supra ITS offers clients the full-service package, and has been Canadian owned and operated since opening its doors in 1999. With a network of integrated companies – each an expert in its field – Supra ITS can build, manage and maintain network and IT infrastructure over key business areas, from Cloud services to strategic consulting, networks and security to service desk and support. As Ontario’s backbone of innovation, the Ontario Research and Innovation Optical Network (ORION) is one of the largest Research, Education and Innovation (RE&I) networks in the world. ORION connects all of Ontario’s universities, most colleges, several teaching hospitals, public research facilities, and a growing number of Ontario’s school boards to one another and to a global network of RE&I connections. In addition to providing one of the world’s fastest broadband connections, ORION is a research and innovation partner for our users. Through our technology and support, ORION constantly strives to keep Ontario on the leading edge of innovation.